Okay. For starters. Abbey San Encino is A) not an abbey, and B) not in San Encino. Printer/typographer Clyde Browne was born in Old Hickory, Ohio, in the summer of 1872. By the time he was twelve years old, his family had moved eight times, leapfrogging back and forth between Ohio, California, Missouri, and Kansas. It was in San Francisco when Clyde was about fifteen that he got a job on the Petaluma Imprint. After serving as a cabin boy and apprentice sailor, Browne jumped ship in 1893 and headed back to Northern California where he worked for a series of newspapers around San Francisco. He also made a living for a while as a piano player in the Barbary Coast area. Browne and his wife moved to Los Angeles around 1902/1903. In 1904, he went to work at the Los Angeles Examiner. He quit the paper four years later and, with Grace Wassum, his new wife (his first died in 1904), left his home around Fifth and Hill downtown, moving into a frame building on Figueroa (then named Pasadena Avenue). He quickly began renovating the house along with setting up a print shop, nicknamed “The Studio”, with Grace serving as a typesetter. It was Browne’s dream to form a sort of artists’ collective in what was already an area filled with artists (Judson Studios and El Alisal are nearby). In 1910, he co-founded the printing firm of Browne and Cartwright. That same year, he convinced both USC and Occidental College to launch their own newspapers, a daily for the former (what became The Daily Trojan) and a weekly for the latter. Browne remained Occidental’s unofficial printer for more than thirty years. 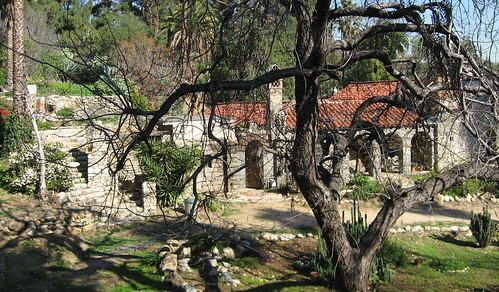 Inspired by Elbert Hubbard’s Roycrofters, Browne moved a garage on his land and, in the summer of 1915, began the decade-long project of building his home, Abbey San Encino. 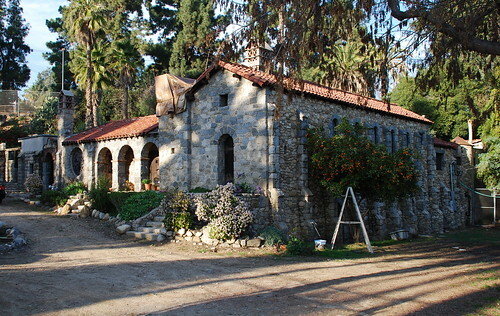 Browne modeled the home on a variety of places, like the Mary Queen of Scots Chapel at Holyrood Castle, the San Francisco de Solano Mission at Sonoma, and Carmel's San Carlos Borromeo Mission. He built a narrow gauge railway to carry stone from the nearby Arroyo Seco, and used odds and ends – nails, bolts, ship lanterns, iron, lumber, hinges, crucifixes, etc. – from ruined buildings across Europe. 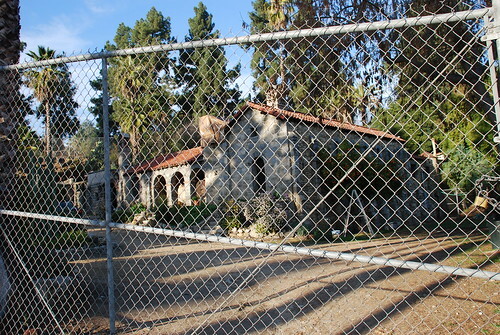 While continuing to write poems and plays and running his printing business, Browne scavenged granite blocks from a demolished building on Grand, sheet metal from old cars, bricks from a poultry yard, an abandoned brickyard, and the Mission San Gabriel, and bells from an elementary school, a Southern Pacific locomotive, and a fire engine. Much of the home’s stained glass came from the Van Nuys Hotel, closing its doors when Prohibition hit. 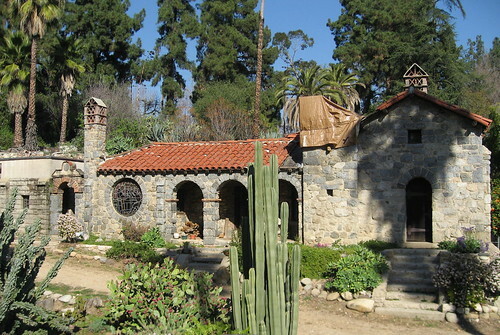 While the majority of the work was finished by 1921, it wasn’t until July of 1924 when the family moved in. Clyde Browne built much of the Abbey himself, originally calling the home “The Studio”, and then “The Old Stone Abbey” which evolved into “”Oldestane Abbey”. Upon a friend’s suggestion, he eventually settled on “Abbey San Encino”. Browne loved all things medieval, and this shows in the building’s cellar, dungeons, refectory, and chapel, the last in which were held many weddings, often with Browne playing organ. The big, round stained-glass window on the building’s south side depicts a Franciscan printer along with an American Indian boy working a handpress. Local tile maker Ernest Batchelder designed the Abbey’s fireplace. 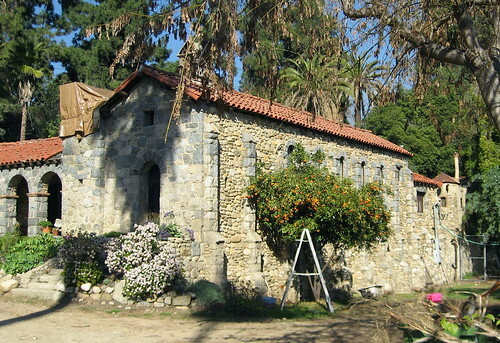 Later, several other stone buildings were put up on the property to serve as artist studios. In 1934, Browne was Chairman of the Democratic Committee, and he ran for State Assembly. Clyde Browne died on July 1, 1942. His shop was closed up, the printing equipment sold. Unless he’s sold the property and I didn’t get the newsletter, Abbey San Encino is owned by Edward Severin Browne, Clyde’s grandson. Severin’s brother, Clyde Jackson Browne, who, along with Severin, grew up in the Abbey, had a brief cameo in a 2003 episode of The Simpsons. 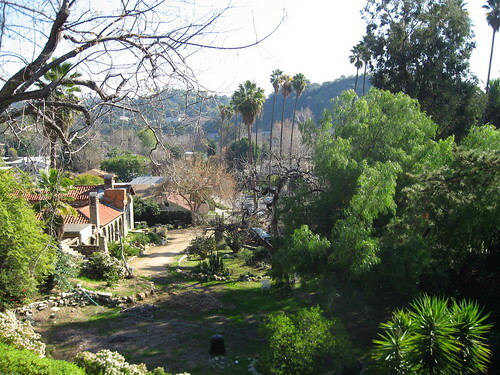 Today, the land is pretty well fenced-off, but you can still see the home okay from the Arroyo Glen side. Severin is a friend, and I've always loved his home. I was not aware of the history. Its just a lovely, calming place. I too call Severin a friend... I've had the honor to lend my assistance when ever the Abbey was in need of repairs. It's an amazing structure. And as anonymous said... it is indeed a calming place. I stumbled past this place when an accident on the 110 forced a road closure and we were routed through the neighborhood. The building got my attention and I went to the 'net to find out what it was, and its history. Thank you so much for answering my questions! Thanks, Leigh. Unless you're on the Gold Line like victoratomic or friends with owner like the anons, you'd probably never catch this place. I'm glad you did. Isn't that where Jackson Brown lives? Or, it was his family home. Miss Havisham, based on the comments here, it looks as though Severin, Jackson's brother, still lives in the house. The history of the Abbey tells of Jackson Browne and his siblings growing up in the Abbey. Although the property is fenced for some privacy and security, be assured that Jackson Browne's brother Severin (a lesser-known singer-songwriter than Jackson)and his wife live in the Abbey today. The inner courtyard, which is behind the fence, is pictured on Jackson Browne's second album, "For Everyman", and is as beautiful as the outside of the home. Thanks, anonymous. I thought I had linked to a shot of Jackson sitting in the doorway, but I guess I didn't. I will certainly look at the LP, one of my favorites of his and just one of a long string of great records, I think. And yet another anonymous friend of Severin talks - Sev and his lovely wife Melinda live there, and like one of the other anon. said, it is a calming and beautiful place where there is often music floating out from the courtyard, or chapel. I stayed there in '83 while visiting a musical friend who was living at the Abbey. Severin was a down-to-earth host and all around good person and the home was not fenced in then. The sounds of water in the fountain were, yes peaceful. The buildings were full of life. Through a friend, I was able to visit the Abbey several times many years ago. I was really struck by its simple beauty, and the fact that it has withstood so many earthquakes without toppling. It should also be noted that Jackson wrote much of his "Late for Sky" album in the Abbey's chapel. The cover house on "Late for Sky," btw, is located across town in the Hancock Park neighborhood. Don't know why that house was chosen, but it's a little underwhelming to see it (especially without the spectacular lighting on the cover). Thanks, anonymous. Late for the Sky is my favorite album of Jackson Browne's, so that's nice to know. I also had no idea the Late for the Sky house is in Hancock Park. If you or anyone knows the address, I'd love to know it, too. Thanks, Charles. I may just sign up. 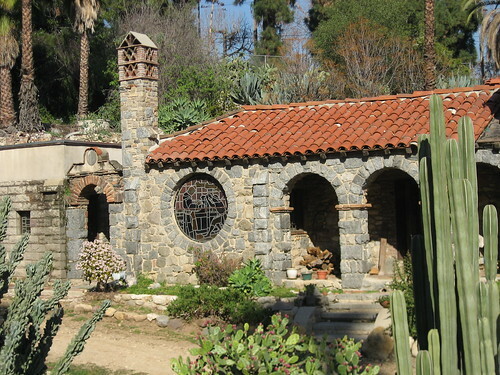 Highland Park Heritage Trust is sponsoring a rare opportunity to tour Los Angeles Historic Cultural Monument #106. I PARTIED THERE WITH JACKSON IN THE 70'S. WHAT A GREAT PLACE TO JUST SIT IN AND SMOKE A LITTLE DOPE AND DRINK A FEW BEERS WHILE MAKING MUSIC WITH SOME OF THE MOST TALENTED PEOPLE IN THE MUSIC BUSINESS. ROB... That house was purchased by Jackson to keep a developer from tearing it down and building a less desirable structure a little too close to the Abbey. It remains vacant. I am hoping to shoot a video at this location. Does anyone know the managers contact? or how I could go about finding it? Look at this booklet I found in an old photograph album from my grandfather. I visited Jackson and company one day in the early 70s as a guest of a family friend, Dane Whitmore, a friend I knew in those years. We sat in the chapel one day while Jackson and the band worked on late for the sky. I only realized months later that I’d been privvy to the creation of a part of that marvelous album.